Another request from Jon Prince in comments, this time for a projection of the future of China's economy with the information transfer model. His particular questions were about whether China's growth rate was sustainable and how long before the Chinese economy reaches information trap/liquidity trap conditions. 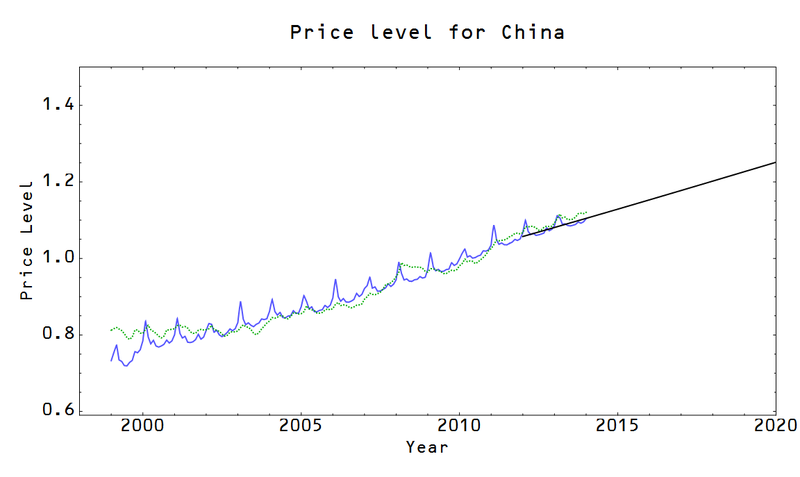 I don't have data on interest rates for Chinese government debt, so this prediction it will only be based on the slowing of NGDP and the price level with respect to currency growth. 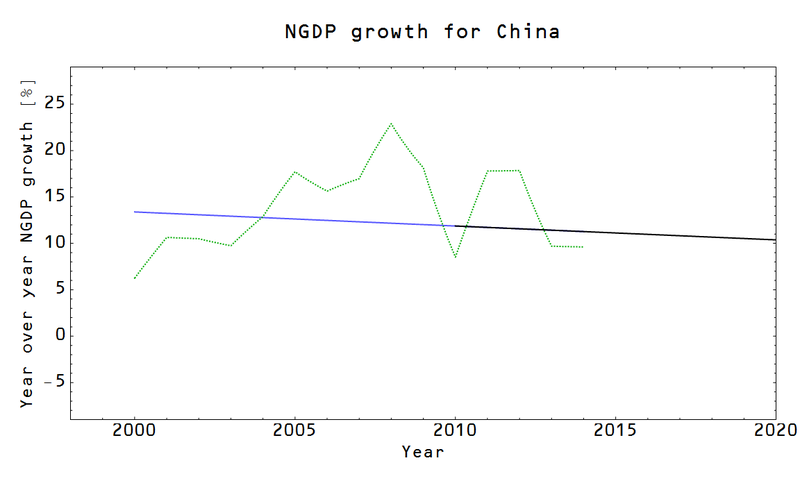 Although there is a slow fall in growth, these graphs show above 8% RGDP growth (and above 10% NGDP growth) through 2020. There will still be some fairly large fluctuations around these predictions, though. 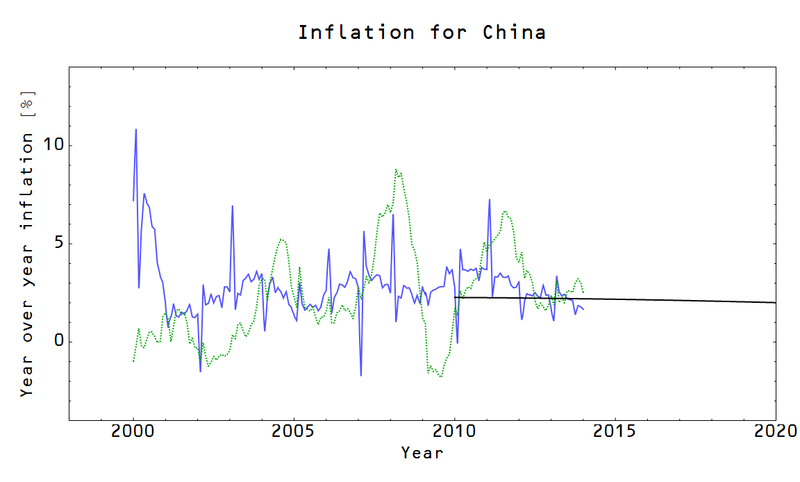 Overall, this is a pretty good position for an economy and I don't see any liquidity traps in China's near future. 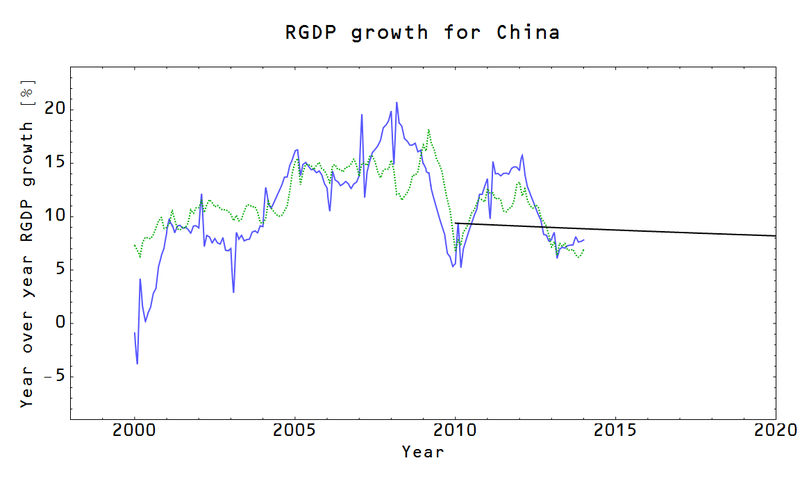 China's very mild economic deceleration will probably be attributed to many things in the mainstream economic media: slowing growth as the economy runs out of catch-up growth opportunities, moving of low cost manufacturing to poorer countries, economic inequality, etc. The real reason is that it's just a manifestation of a universal behavior of large economies -- at least if the information transfer model is right. I wish I could understand this blog. And if you have any specific questions, go ahead and ask; I do my best to be responsive to every question! I, too, find the blog fascinating. It has caused me to blow the dust off my old thermo books. Here's a question that might help me get what's going on here: What happens in the model if MB is constant? The result is that NGDP just fluctuates around a given point -- I have no idea yet on how to estimate the size of the fluctuations. The shocks to NGDP actually average to be positive (think population growth), but there is no limit to how big negative shocks will be. 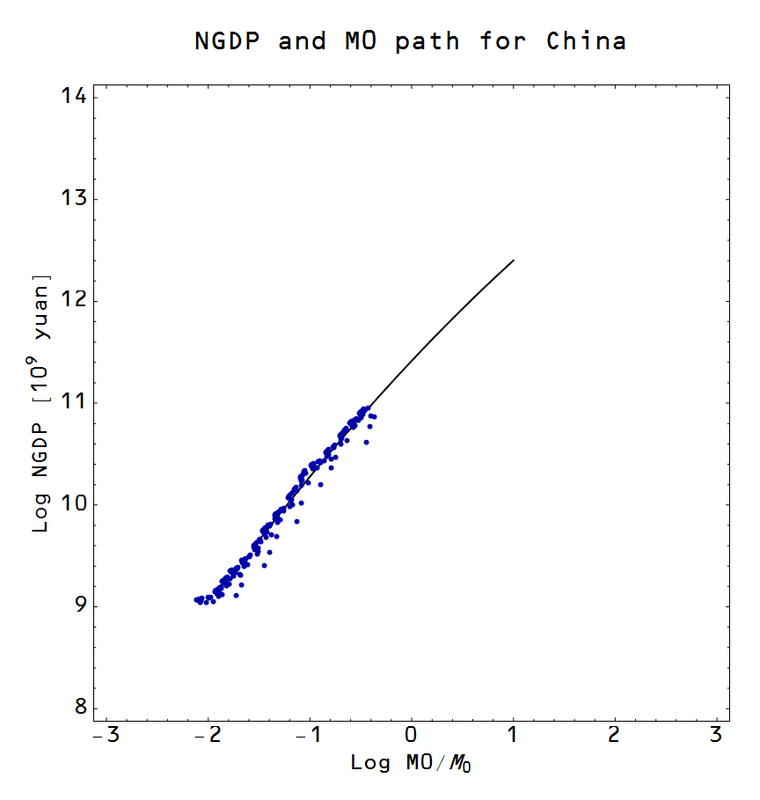 NGDP would take a random walk that would look like economic growth for awhile followed by a crash.